Scots is the language variety used throughout Lowland Scotland, Ulster, Orkney and the Shetland Islands. The Scots and Scotland blog is on the right, is a mixture of random thoughts on Scots and some research for a book I'm writing on Scots society and language. 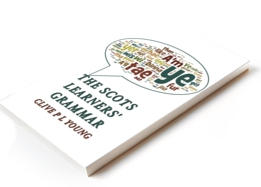 Below you'll also find the Scots Learners' Grammar, the first part (hopefully) of a Handbuik to help learners speak and write the language..
Grammar is the glue that holds any language together and is made up of the rules that make our speech and writing comprehensible to others. Although native speakers of any language have an instinctive feel for these structures, learners usually need some formal guide. In the case of Scots, however, even fairly fluent native speakers are likely to be unaware of the language patterns they are using as they are almost never taught. It is only when the ‘rules’ are written down can speakers and learners appreciate how rich Scots grammar is and how much it differs from standard and colloquial English. Scots is usually spoken and often written in some mixture with English. Knowledge of grammar helps speakers and writers distinguish between the Scots and English components. In such mixtures ‘good’ Scots is commonly misidentified as ‘bad’ English, so it is important especially for teachers and writers to be able to tell the difference between the two. So what does ‘good’ Scots actually mean? Grammar forms evolve but are not random inventions. The ‘good’ forms described here usually derive directly from traditional printed Scots usage and have proved to be remarkably consistent over both time and geography. As we shall see, spoken and literary Scots grammar has been documented in detail for almost a century. Grammar thus links Scots with its historic pedigree but also ties the various dialects of Scots together. Pronunciations and even vocabulary may vary from Shetland to Ulster but as Christine Robertson rightly notes in her 2012 grammar for children “We hae mair things in common than we hae keepin us apart. Ane o they things is grammar”. Given the status of Scots as a primarily spoken tongue, many researchers report a loss of distinct grammatical forms due to convergence with English, but what is really astonishing is how much remains. This guide is designed for teachers and writers of Scots and aims to give a concise overview of the distinct features of Scots grammar, based on both modern descriptions and recent research. 1.1 What is ‘Scots’ grammar? A common root and many centuries of close contact between Scots and English have ensured that the grammars of the two tongues are broadly similar. This is good news for an English speaking learner, but care still has to be taken, as there are many traps for the unwary. Despite an increasing number of publications, the grammar of Scots, like its orthography and vocabulary can still be considered as being somewhat fluid. Inevitably authors – including myself with a Central Scots background – are strongly influenced by local dialectical variations, so there are inconsistencies between the various accounts. This guide aims to find the consensus and highlight some of the main points of difference with English. This comparison is not to imply that Scots is ‘non-standard English’ but simply that most learners of Scots have some knowledge of English grammar, so it is a sensible place to start. Some ‘grammatical’ terminology has been inevitable to give this document some structure, but I’ve tried to keep it to a minimum and explain what the terms mean. It may come as a surprise but the grammar of spoken and literary Scots was first described systematically almost a century ago when two comprehensive grammars were published within just a few years. James Wilson’s fascinating but largely forgotten 1915 field study Lowland Scotch was based on interviews with inhabitants of the Perthshire village of Dunning and uses a marvelous phonetic orthography to capture the sounds of the vernacular. This was followed by William Grant and James Main Dixon’s 1921 classic Manual of Modern Scots that takes a completely different approach focusing on a meticulous analysis of the literary language over two centuries from the late seventeenth century. Between them these two works provide a remarkably consistent and cohesive snapshot of the spoken and written language before the First World War. Unfortunately both these essentially ‘descriptive’ grammars were out of print for decades so failed to make the impact on Scots they should have. However from the late 90s a range of ‘prescriptive’ grammars for Scots appeared, aiming to set out rules of usage. David Purves’ booklet A Scots Grammar was published in 1997; about the same time as Andy Eagle’s online Wir Ain Tung, essentially a reworking of Grant and Dixon. Also in 1997 Philip Robinson produced the masterly Ulster-Scots – a grammar of the traditional and spoken language, again something of a homage to Grant and Dixon. These reference works were joined in 1999 by Susan Rennie’s Grammar Broonie, a workbook aimed at young learners and in 2002 by L Colin Wilson’s Luath Scots Language Learner, the first-ever Scots language course for the complete novice with extensive sections on grammar. Christine Robinson’s 2012 Modren Scots Grammar has a notably different focus and introduces grammar to children (and their teachers) through the medium of Scots. Especially over the last 40 years there have also been numerous small-scale studies of language use in Scotland, usually published in (for the public) rather obscure academic journals. However much of this was drawn together by Alexander Bergs in Modern Scots, a detailed review of literature which essentially updates Grant and Dixon based on more recent sociolinguistic research. Bergs is perhaps the most definitive published descriptive grammar of Scots to date, though is hard to obtain. Scots expert Christine Macafee’s unpublished monograph Characteristics of non-standard grammar in Scotland last updated in 2011 takes a similar approach but is alas no longer available online. This fascinating document draws from both linguistic research papers and modern literature though uses a linguistic terminology perhaps challenging for general readers. 1.4 Descriptive or prescriptive ? As David Purves reminded us in 2002 “in any language revival, an essential stage is the fixing of standards amongst the welter of variation that is always found in the untended garden of natural speech“. So far no ‘official’ body has emerged in Scotland to ‘fix standards’ but the publications above provide the next best thing; a remarkably consistent description by language scholars of how the core grammar of Scots currently functions. In the absence of a ‘circumscribed’ standard we have is what some have called a ‘circumstantial’ standard, but it is a standard nonetheless. This grammar was therefore created to build some of the newer academic descriptive research into the prescriptive grammar approach, essentially to provide as strong a validation as possible for the Scots grammar ‘rules’. It should be noted though that Scots being a primarily oral language there has always been a very close link between descriptive works like Grant and Dixon, Bergs and Macafee with more prescriptive texts like this one. This has been less true of English where prescriptive grammars dominated until comparatively recently when English ‘corpus’ grammars based on databases of actual usage appeared. There is a strong caveat though, Scots ‘corpus’ work is in its infancy and is limited by the way Scots is used in practice. Thus, although all the grammar elements described in this grammar have been recorded and where possible cross-referenced between several works, their frequency of use is largely unknown. What is described here is as close as we currently have to ‘standard’. As Robertson mentions above the somewhat overstated dialectical variation in Scots pronunciation and vocabulary Purves alludes to does not seem to extend to grammar. Some of the grammatical variation between the various Scots dialects are noted in the text. If you want to increase the strength of your Scots writing or speaking, you can simply use these forms more. In everyday speech of course people tend to mix up Scots and English vocabulary and grammar in varying strengths depending on the context and the speaker’s own experience. It should be noted individual speakers are unlikely to use regularly, or even have encountered, all of the forms listed here; so what you choose to use in any given situation is a matter of confidence and style. The grammar described here however is most definitely ‘live’ and useable in the sense the forms have been recorded relatively recently in speech or writing by researchers. Some features here may be what linguists call ‘recessive’ (i.e. becoming less common) but you can have confidence using them as ‘correct’ Scots. One of the most tiresome controversies among Scots activists is how to spell the language. There is still a tendency for some individuals, under the mistaken belief that there is ‘no Scots standard’ to simply make up their own systems with dire consequences for ease of reading. As modern Scots has been published for over a hundred years not surprisingly a standard has had to emerge. This is not ‘endorsed’ by anyone but could be simply described as ‘common practice’. The William Grant and James Main Dixon’s 1921 classic Manual of Modern Scots was perhaps the first attempt to codify the spelling of the literary language, but in the last 20 years two ‘prescriptive’ dictionaries appeared which only list the commonest written variants. These are The Concise English-Scots Dictionary (1993) and the Essential Scots Dictionary (1996). These systems are not without controversy, some claim they pay insufficient attention to dialectical variation and the system itself is Anglicised (i.e. not based on either phonetic or older Scots spellings). There is some validity in both of these criticisms but despite occasional attempts to develop a more ‘authentic’ system, currently this is really the only widely-used system. I believe anyone wishing to move away from DIY spelling to something people can read comfortably should refer – at the moment at least – to these companion volumes. Both were used extensively to provide a standardised spelling for this grammar.